All Hutterite children attend an on-colony school built and paid for by the community, usually staffed by the local public school boards. Colony teachers, who are typically non-Hutterites, generally follow the provincial or state curricula. Hutterites in the USA and in Canada start attending public school on their home colonies by age 5. In the last few years, in many of the less conservative colonies especially among the Schmiedleut and increasingly so on Dariusleut colonies, more emphasis has been placed on higher education. Hundreds of Hutterite students have graduated with Grade 12 diplomas in the last two decades. Before the 90s, very few Hutterite students achieved grade 12 certification. 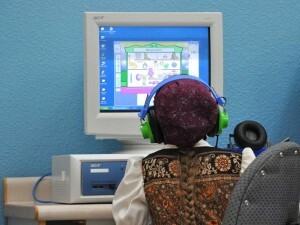 High school education in many colonies is often delivered over an interactive TV system, via the web, or via teleconferencing. 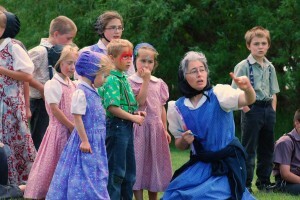 In about a third of the Schmiedeleut colonies, university trained Hutterite men and women staff and teach the colony’s children between the ages of 5 and graduation. Just a few years ago this occurred only rarely. Hutterite colonies also employ a German school teacher who has multiple responsibilities involving students aged between 5 and 15 years. Some of these responsibilities include the teaching of German, biblical texts and traditional songs as well as supervising children during meals. his German teacher or Teicha Schuellehrer is also responsible for supervising the children during their three common meals a day along with a helper who is usually his wife. The German teacher is also maintains discipline among the children and provides summer supervision or chores for children.